Two years ago the Winnipeg Jets hosted an outdoor game for the first time donning a throwback jersey straight out of the WHA. They wore it two more times during that 2016-17 season before shelving it last year in the season without third jerseys. Late this past summer, the Jets introduced their first-ever alternate uniform, and there were reports this retro jersey would come back at least once a season going forward. That’s official as of today! This morning, the team announced plans to wear their Heritage jersey twice during the 2018-19 season — now in the modern Adizero cut. The first occasion will be on the road against the Edmonton Oilers on Dec. 31 — a date already announced by the Oilers to be one of their retro jersey nights. The Jets wore their Heritage look twice against Edmonton on 2016-17, but both times the Oilers donned their orange throwbacks. This New Year’s Eve game will be the first time it goes up against the Oilers’ royal blues. 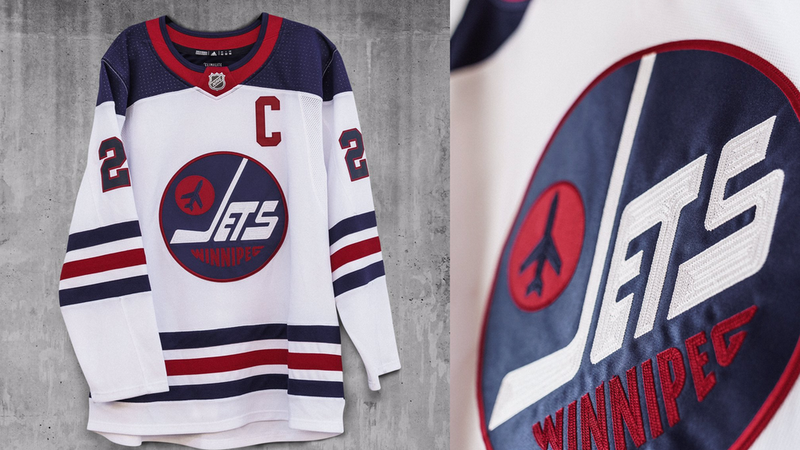 After that, we’ll see the retro Jets look one more time this season on Feb. 26, 2019 when the club inducts two more members into the Winnipeg Jets Hall of Fame. So many fans complained when the aviator blue third jersey came out in September, this move makes me wonder what happens next. If the throwback sells better, will it become the new full time alternate uniform? Personally — and I’ve said it before — I think the Jets are playing this absolutely right. You save the straight throwback for rare special occasions — in this case New Year’s Eve and Alumni Night — and wear a third that’s different from everything else in your wardrobe.